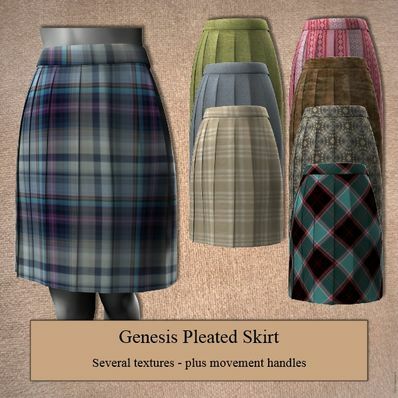 A Pleated Skirt for use in Daz Studio 4.6. Several textures included, plus movement morphs. Unzip and copy the data, People, & runtime folders to your "/Documents/DAZ 3D/Studio/My Library" folder. You are some kind of crazy wizard who makes exactly the sort of thing that I need but can't find anywhere else. Please keep it up!